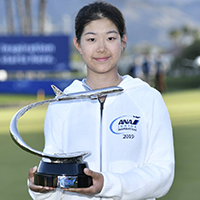 Congratulations to Cindy Kou on your win at the ANA Junior Inspiration! We are thrilled to be a part of your success by handcrafting the trophy that will be a cherished memento! Inspired by the ANA Inspiration brand Malcolm designed a hand-sculpted sweeping rhodium plated bronze pedestal for the Boeing 787 in flight. This sleek sculpture mimics the distinctive ANA logo of a plane rising to the heavens. 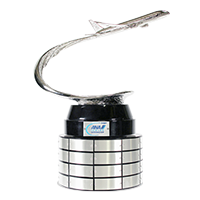 The trophy stands at 12” tall by 16” wide and is mounted to a polished black acrylic base. The trophy is a creative blend of the title sponsor brand and the essence of the tournament—an event that ascends the development of girls golf. The team at Malcolm DeMille is honored to work with IMG and the ANA Junior Inspiration to bring attention to such an outstanding event!